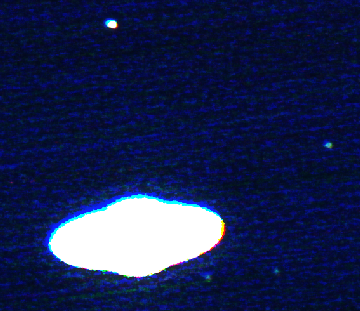 The conventional wisdom says you can't do much astronomy around bright street lights, that you can't take good pictures through a Dobsonian Reflector telescope, and that you definitely can't photograph outer solar system moons with one. I'm happy to report it's all wrong! 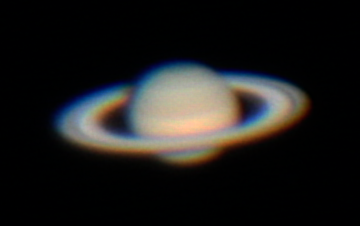 My brother and I used a relatively inexpensive 254mm Dobsonian Reflector telescope, which some amateur astronomers build at home, and a 3x Barlow lens, to get some pretty decent pictures of Saturn and its moons. Dobs are mechanically simple. The Earth keeps turning and they pretty much sit there. So at any serious magnification, objects pass into and out of the telescope's view quickly. If you tried to take a conventional "long exposure" photograph, you'd get star trails. Fortunately, there's stacking. "Stacking" is a neat trick where you can use a computer to treat a video like a very long exposure photograph. In fact, better than. You take all the best frames & computationally smoosh them together into a single picture. DSLR cameras boast "high definition" video, but it really only uses about a ninth of the pixels on the imaging array! Fortunately, many Canon DSLR cameras let you choose to have those pixels be contiguous. That's good, because you can put all of them behind your image. The feature is called "movie crop mode" on the EOS Rebel T2i, and 3x digital zoom on later models. Getting your target in this frame is not easy, but with patience and a well-calibrated finder scope it can be done! I haven't found an image stacking program that I love yet. I used Lykenos on Mac OS X. Automatic frame alignment is a must-have feature. The stacked image suffers from two problems: the planet is too bright, and its moons (mostly out of frame, above) are way too dim! It's pretty amazing that our eyes can see the planet and its moons through the telescope at the same time. To see them in the stacked digital image will require more work. For this post-processing, I used Photoshop. But you could just use Gimp, Picasa, or iPhoto (free with Mac purchase). You can accomplish a lot with just the brightness and contrast controls, but the moons may be easier to tease out using Levels adjustment or Gamma filtering. So here's the finished product, 129 frames stacked from July 17 at 10:16 PM local time in Hyattsville, Maryland. My father-in-law points out that you can see the Cassini Division in the rings, and some banding on the planet. That's almost certainly Titan, up top. The vaguely Saturn-shaped thing is glare off the planet. If you're curious, here's the video that these images were constructed from. Thanks to Alan, for moral support!